Synopsis: The Agatha Award winner for Best First Novel 2003, Maisie Dobbs is the beginning of a series about a young woman in post-World War I London who sets herself up in business as a Psychologist and Investigator. Although it seems strange to consider mysteries from a healing perspective, these novels are very much focused on that. I started the series in the middle and found myself hooked. Finally, after reading book seven (book eight is now out), I read this one, the first in line which introduces Maisie Dobbs, as a woman in 1929 and as the girl in the back story who struggled to get there. Maisie was 13 when her mother died and her father arranged for her to go into service as a maid to a wealthy family. Her life changed again when Lady Rowan Compton discovered her reading in the black of night in the manor’s library, greedily absorbing knowledge about anything that caught her interest. Instead of being dismissed, as she’d expected, Maisie was supported in learning by Lady Rowan and a family friend, Dr. Maurice Blanche, revered for his investigative work with Scotland Yard. She started her advanced studies at Girton College, Cambridge, but The Great War, 1914-1918, put an end to that. Maisie instead became a nurse and was shipped to the battlefields of France. She experienced horrors that haunted her dreams as did the soldiers who survived. After the war, she returned to Girton; then became Dr. Blanche’s apprentice. When he retired to the countryside of Kent, a place that holds almost as much importance as any character in the stories, she opened her own business as Psychologist and Investigator on Roylston Square in London. The big case in this first book, a tedious-sounding infidelity, took her right back into the memories and aftermaths of that war. I find the character of Maisie sympathetic in her thoughtfulness and determination to do all she can to restore equilibrium in the people whose lives she disrupts; I like most of the other characters, too. The writing feels true to the era, the details fascinating, and the plight of a generation of single women whose men were killed or permanently damaged clearly illustrated. Maisie uses her psychological training to unearth villains and set affairs right. 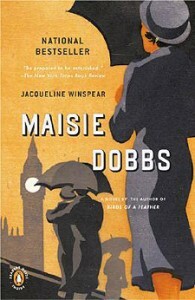 The later books in the series get even better –or maybe I just plain like Maisie Dobbs and her world. Next Next post: New Media Reviews pages!